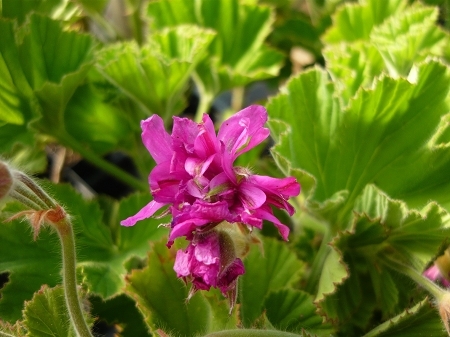 Sonoma Lavender Scented Geranium - Large fan shaped green leaves on thick upright stems. Leaves have a pleasant scent though not convincingly of lavender. More aptly named for it's large showy dark lavender-colored flowers when in bloom. Perennial zones 10-11+ Live starter plant in 3 inch container.